Don’t feel like waiting in line? Check this out! 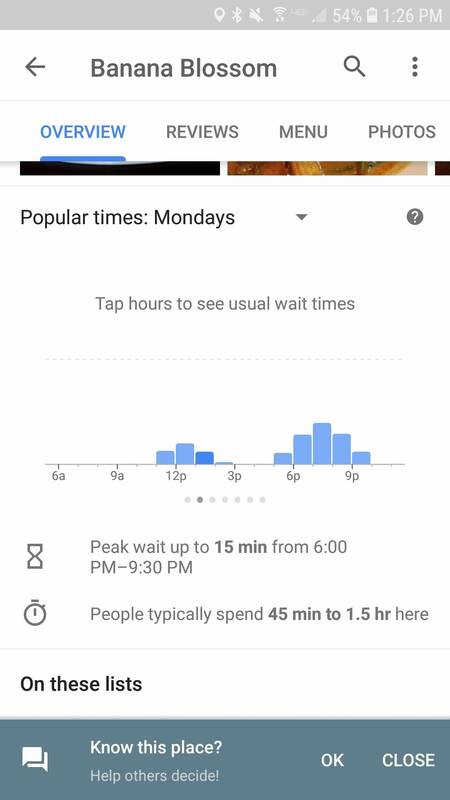 Google is now able to give you wait times at local restaurants, stores and even you BMV! I know, crazy; but it’s true! Searching for a place to eat while on a tight schedule, you can find out how long you might have to wait to be seated. Planning a lunch time trip to the BMV? Maybe Wednesday is better than Tuesday. So not only do you have the ability to find out what others say about the new sushi restaurant that just opened, but you can now find out what the wait times are! All you have to do is scroll down! Yes, pick your place and then scroll down. (I’m sure just like myself you have seen this little graph but paid no attention to it.) So now you can get the menu, cost, reviews, and now wait times. This all happens by just walking in the door. Your phones GPS and WIFI sign tells Google how long you’ve been there and as more or less people come in the door and leave, it can calculate how long you might expect to stay at the place you are visiting. This happens both in real time and historically. The more popular a place is the more data is collected. For businesses it can be a great way to increase your business. If you are the owner of a coffee shop and use this information to see trends in your peak and off hours you can develop strategies to increase hours during down times. If you see people are waiting too long that could mean you need more staff to keep up and cut down on bad reviews (no one likes to stand in line). You can also see how long people have normally spent at your place of business are you turning over the tables at your restaurant effectively? Look up your competition, are they busier than you at certain times? Why? Maybe that is something you need to look at. More importantly, is there any information at all on your store? And if not, why not? This is 2018 and we live in a fast pace instant gratification world. People are on the move, and if people can’t find you or your business they move on. Google is no different, as a matter of fact Google uses only the most up to date and relevant information to move you up the ladder. The more people go to your business (either by the web or walking into you’re your business) the more people rate your products or services, the more likes, hast tags and tweets you have the high you rate. Google doesn’t know everything, yet. But it in today’s digital age it knows a lot. Both customers and business owners utilize it for their benefit. So, are you in a hurry to get coffee or are you in need of more customers. Google can help you with BOTH!